Friday, you sweet son of a gun, am I glad to see you or what?! Have you all had some bright spots this week? I really hope so. Over here, the days feel long when they’re spent attached to a 5 week old while running after an almost two year old but thank goodness and hallelujah that summer + maternity leave = weekends at the lake. My parents have a little spot on the water at Lake Martin, so during the summer, they spend a couple months in these parts and I have a location for weekend retreats. And, to be clear, by “retreats” I mean no makeup, extra hands to help with chi’rens, and all the grilled chili dogs and burgers my post-natal body can handle. PRAISE! 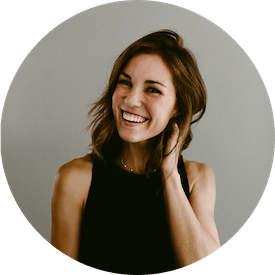 I’m excited to be able to share with you all twice this week. Ever since we talked about pie crust earlier this week, I’ve been trying to determine which recipe I was going to post today. I have a few pies up my sleeve but, you know, I can’t show you all my cards at once so let’s settle for one recipe at time, okay? In preparation for today, I did a little more research (read: made and consumed way too many pies) to make sure I gave you the most appropriate of appropriate pie recipes today. After much deliberation and several scoops of ice cream to make my pie tests “a la mode”, I’ve decided on a summer staple: mixed berry pie. Well, berry almond streusel pie, to be precise. Me and the berries get along real well in the summer on account of all the farm stands and pick-your-own berry fields that have popped up here in central Alabama. Also, is there anyone who doesn’t like at least one variety of berry? I don’t think so. 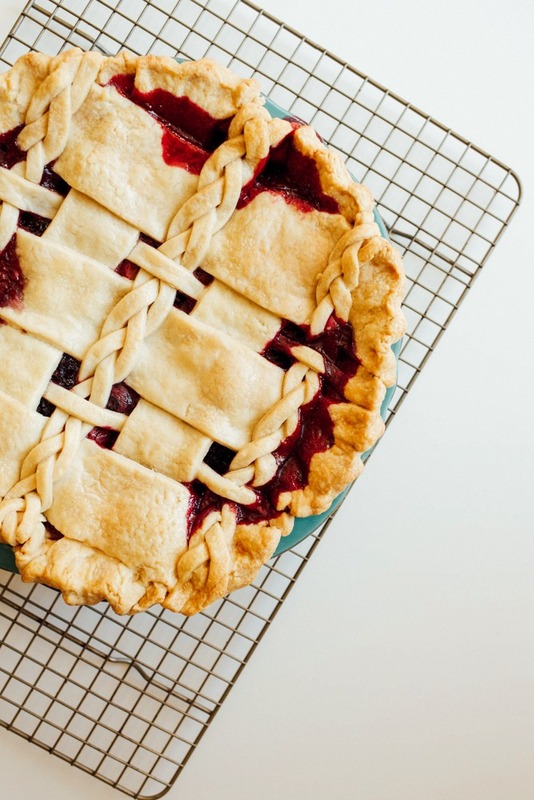 I decided on a mix of blueberries, strawberries, blackberries, and raspberries for this pie, but the beauty of this recipe is that you can go any direction. Use whatever you have on hand, whatever is growing in your backyard, or whatever is BOGO at the supermarket. Once you have made the ultra-critical decision of picking your flavors, and given that you read my last post and know how to make stellar pie crust, the hardest part of making this pie is waiting for it to cool to room temperature and set up completely. No judgement here if you dive in spoon first the second it’s cool enough to shovel in to your mouth. Been there, done that. 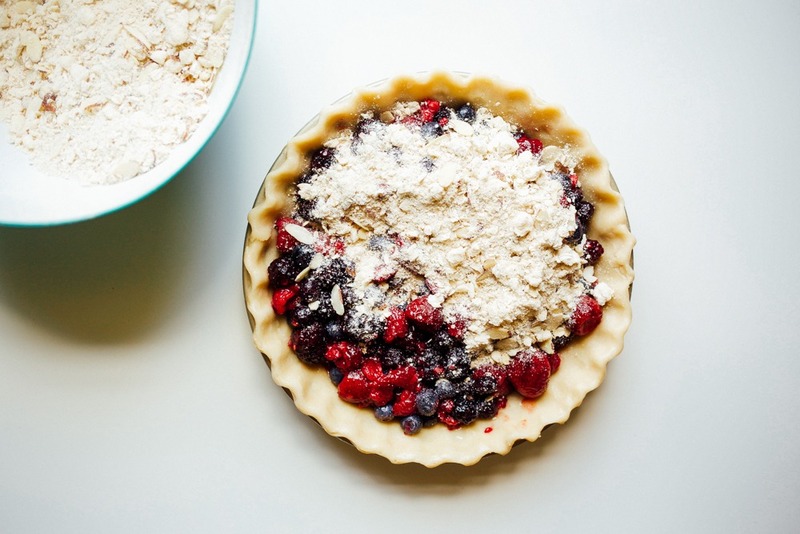 The crumb topping on this berry almond streusel pie comes together easily and is a terrific alternative to making a double-crusted pie. I’ve included a photo of a double crusted pie I fixed earlier this year when I was testing dough braiding. Let’s just say that whole braiding thing is easier said than done. With two babies on the hip this summer, I’m going to stick with streusel toppings for now. 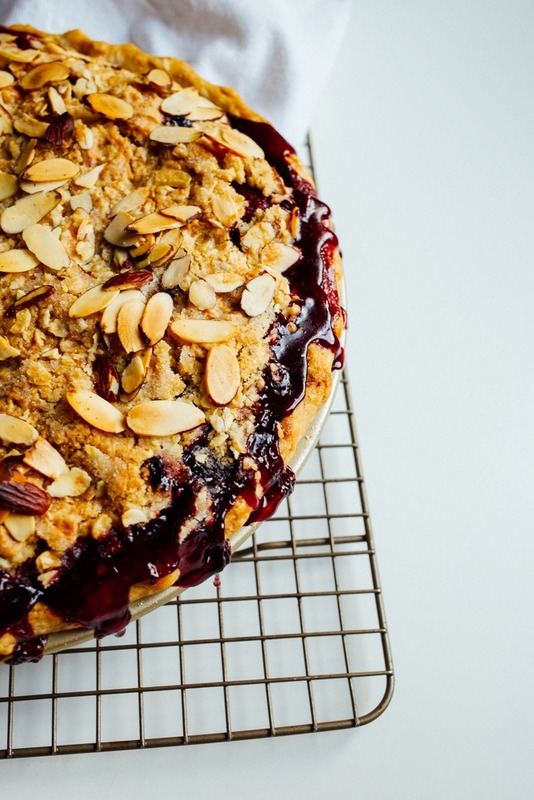 This recipe for berry almond streusel pie will fill a standard 9″ pie plate. If you’d prefer to use a deep-dish pan, increase the filling by 1/3 and cook a bit longer. 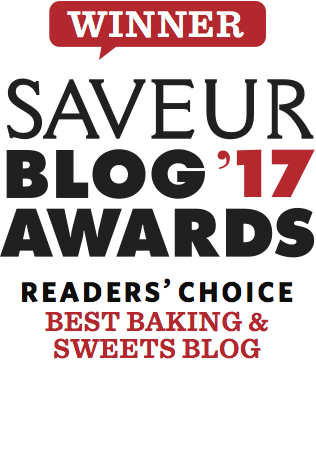 I’ve even halved this recipe and prepared pies in mini 6″ dishes that turn out great and make for a terrific pie for two! My favorite though is the standard 9″ pie because it’s great for sharing manageable-sized slices with friends. 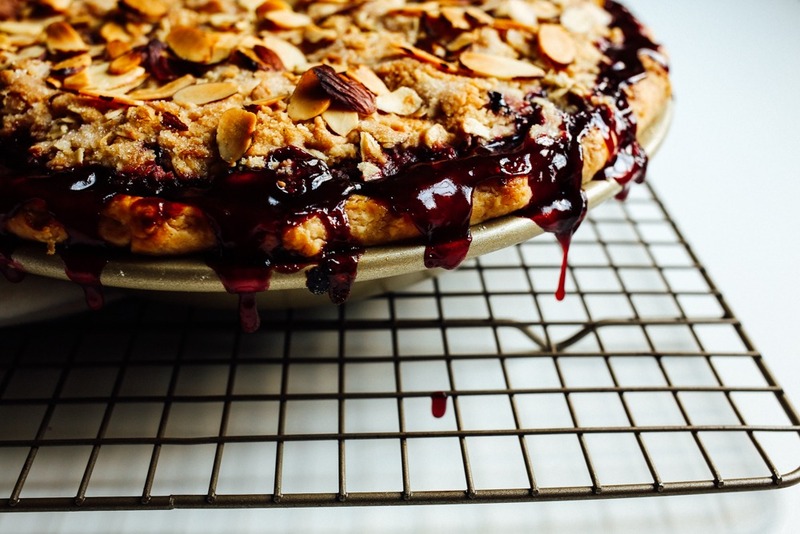 Let’s embrace the weekend and the onset of summer by making this berry almond streusel pie and let me know how you love it! Cheers to the weekend and to summer baking! For my favorite double pie crust recipe, click here! This berry almond streusel pie is stuffed with juicy, mixed berries and topped with a buttery, almond specked crumb topping. Combine the flour, oats, sugar, and salt in a medium sized bowl and stir to combine. Cut in the butter using a pastry cutter until it comes together in pea-sized clumps. Toss in the sliced almonds. Refrigerate until ready to use. 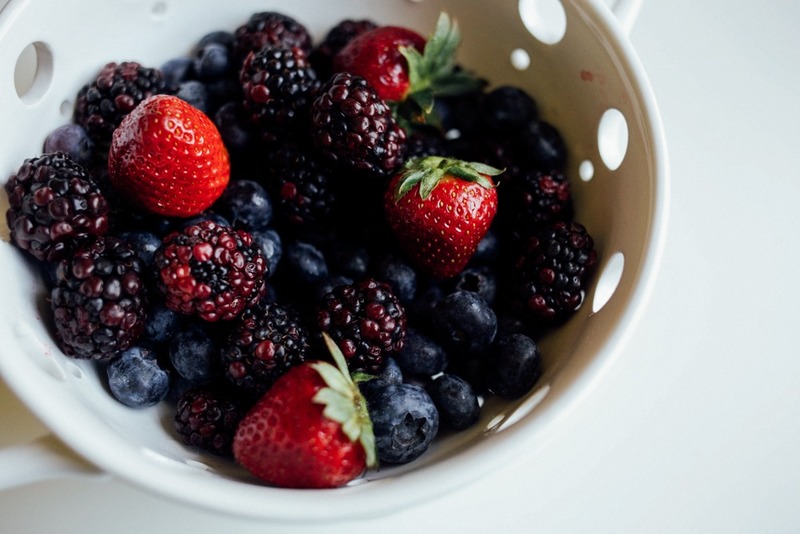 Toss the berries, lemon juice, and extracts together in a large bowl. In a separate, smaller bowl, combine the dry ingredients. Add the dry ingredients to the berries bowl and toss to combine. Allow to sit for 20 minutes while you prepare your pie plate. Roll your pie dough to 1/8-1/4″ thick and place in a 9″ standard pie plate. Trim excess dough from the edges and crimp your crust as desired. 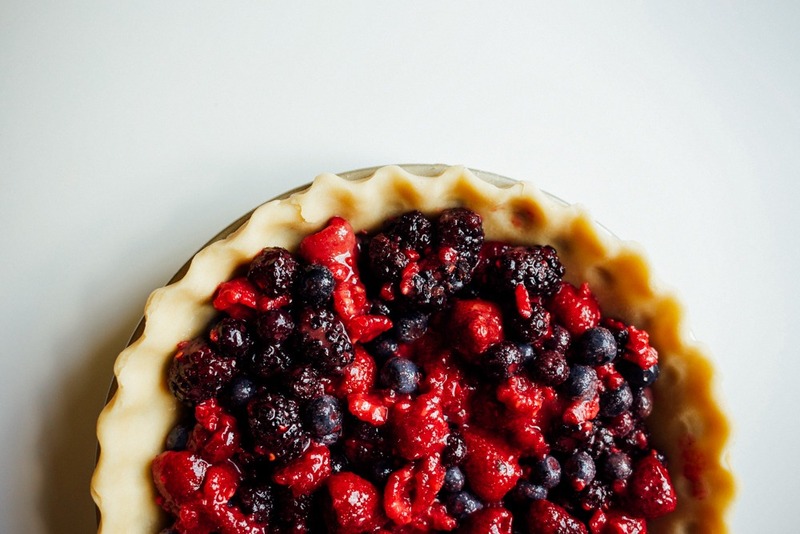 Spoon the berries into the prepared pie plate and drain off any excess juices. Top the pie evenly with the crumble topping. Whisk together the egg and water to create an egg wash. Brush evenly over all of the pie crust edges. Place pie in the preheated oven and bake at 400 degrees for 30 minutes. 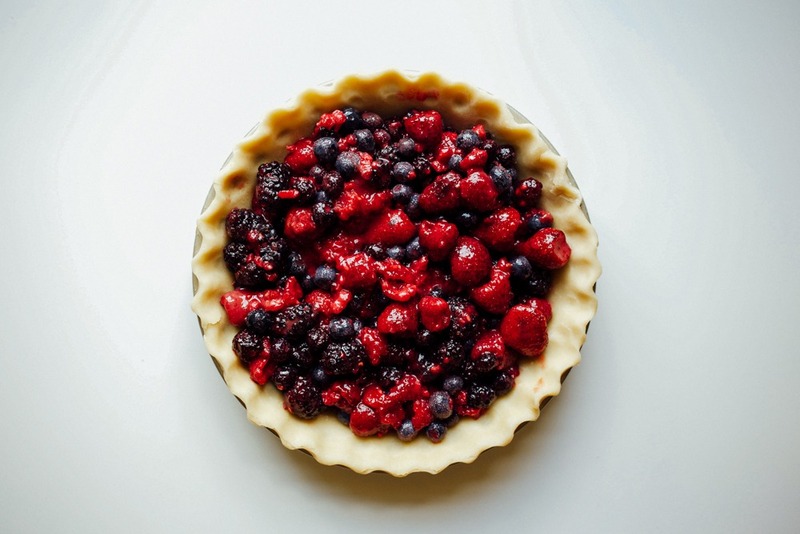 Decrease oven temperature to 350 degrees and bake for an addition 1 or 1-1/2 hours, or until the filling bubbles thickly around the outside of the pie. Once done, cool on a cooling rack until room temperature, at least 6 hours or overnight. 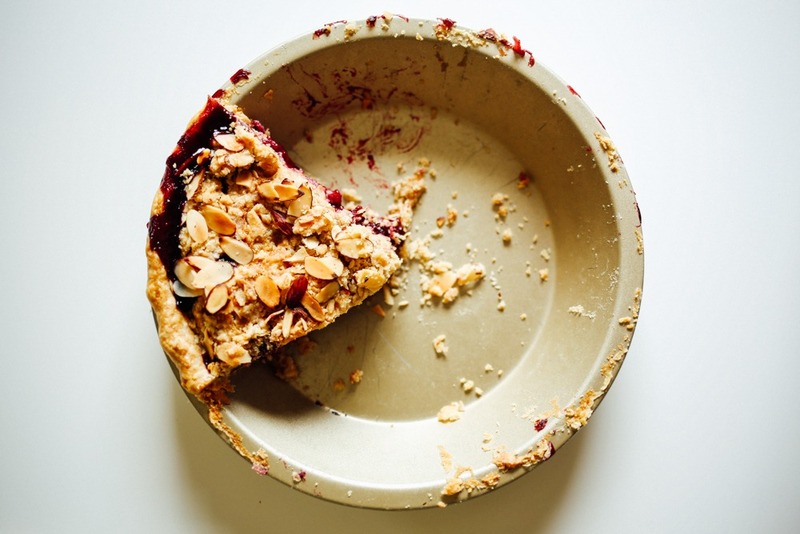 Keep your pie crust and streusel cold until it is placed in the oven. Cold crust and streusel is easier to work with and will perform best in the oven. Keep in mind that this recipe works best in a standard 9″ pie plate and is not intended for a deep-dish pie plate. Increase filling ingredients by 1/3 in order to fill a deep-dish plate. Use another 1/2 recipe of pie dough to top the pie if you prefer a double crust pie. Be sure to brush all of the crust with the egg wash. This will help the crust to brown beautifully. Thank you for the kind word- I’m so glad you’ve decided to pop by to visit! I think you will really enjoy this pie if you decide to make it… let me know if you have any other terrific pie ideas! So delicious! Cannot wait to try!